COSMETIC DENTAL SPECIALISTS (New York) - Book Appointment Online! Cosmetic Dental Specialties has been in practice in the same location at 30 Central Park South since 1982. A family owned dental practice who are specialised in different areas of dentistry, therefore the patents get all the work done in the same office. The three doctor Edalat's who are specialised in Periodontics, Prostodontics, Invisalign, General and cosmetic dentistry are uniquely bonded as a unit, thus they communicate effectively with one another and share their strengths and experience to benefit every one of their patients. In that light, one of their guiding principles is that each patient is listened to as an individual and their needs are met with compassion and state of the art dentistry so that they may will achieve optimal function and aesthetics while improving their self-confidence. 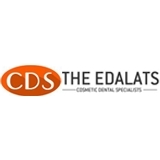 Dr. Edalat is an exceptional dentist ! he is genuine as a person and a professional. He works together with his father and his sister and they collaborate on difficult cases together. They are all highly specialized in what they do so that gives me a lot of confidence in trusting my mouth with them.